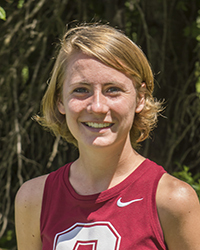 Class: Senior Hometown: Tucker, Ga.
NOTES: Three-year letterwinner... All-PAC honoree... 2015: Ran in all seven regular-season races ... Season-best 25:00.4 at the Gettysburg Invite ... Finished 25th at the PAC Championships in 26:04.0 ... 2014: Competed in six races... Improved as the season progressed to become a constant member of the top-seven... Earned All-PAC Honorable Mention after finishing 17th at the PAC Championships in 24:46.7... Ran a career-best 24:21.1 to finish 101st at the NCAA Mideast Regional and help the Wolverines to a ninth-place team finish... 2013: Competed in seven meets during first year with the team... Took a minute and a half off her previous best to run a season-best 25:07.70 at the PAC Championships, good for 32nd place.